Barack Obama is the 44th President of the United States of America. 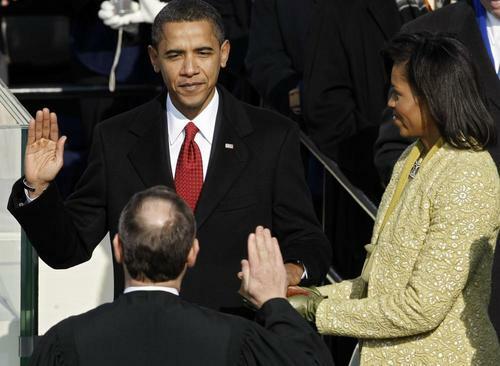 The Inauguration on January 20 2009 is historic in many ways, and in the minds of many in the US and around the world, it comes at a critical time. Obama inherits a daunting array of problems both domestic and international, but one of the remarkable facts of the moment is that he shows enormous confidence; he has no doubt that we will suceed in meeting the challenges. The confidence is quite obviously justified by his gifts of calm and clarity, and great personal charisma, and wisdom and, and, and... His confidence is not only personal, but grounded in his expressed beliefs in the American people and our democratic system. The formal event specification for the inauguration was extended both before and after the swearing in, attempting to capture the anticipation and the celebration of 1.5 or 2 million people in Washington DC, and hundreds of millions watching the ceremonies on TV all around the world. The event was set for 06:00 on the 20th to 02:00 on the 21st, Eastern time. This includes roughly 5 hours before the ceremonies began, and 6 hours before Obama became President at 12:00 noon, and continues through the afternoon and evening, and the inaugural balls. The result is graphically quite striking, with no trend for the first 4 hours of the period, then a very steady trend showing smaller than expected network variance for about 12 hours before it changes to a period of relatively large variance. The statistical outcome is Chisquare 71503.495 on 72000 df, for a p-value of 0.877 and Z = -1.162. In the next figure (which is one of several non-formal, contextual explorations) we deliberately select the most striking part of the dataset, from 10 am to 7 pm Eastern time. Had this period of time and direction of trend been specified in our prediction, the associated probability would be 0.009 with a corresponding Z-score of 2.354. The GCP signal to noise ratio is too small for strong interpretations of individual events, but it is worth noting that persistent low network variance is often associated with occasions that are meditative and celebratory. Other perspectives and explorations provide more context and insights on the question whether the GCP network took note of the global focus of attention on the inauguration, and we will include them as they become available. In addition, it is interesting to look at several events we identified that represented the Obama Effect during the campaign and election. An exploration by Dean Radin, looking at the shape of the data distribution represented by the skew statistic may be seen on Dean's blog. A Re-analysis of Dean's inaugural spike. The occasion was emotionally powerful and many have written about their personal experiences. To reflect some of this as it came across my desk, I have made a page with some especially moving and thoughtful reactions to the inauguration. Finally, a general cautionary note on the analysis of GCP data: It is important to keep in mind that we have only a tiny statistical effect, so that it is always hard to distinguish signal from noise. This means that every "success" might be largely driven by chance, and every "null" might include a real signal overwhelmed by noise. In the long run, a real effect can be identified only by patiently accumulating replications of similar analyses.